Blackjack is one of the most recognized and played games in casinos all over the world, the same applies in online casinos. These rules are brought to you courtesy of Winner Online. Our Blackjack Strategy section gives 2 basic strategies for the2 main varieties of Blackjack mentioned at the end of this rules section. The object of blackjack is to get a total value of cards as close to 21 as possible without going over and beat the dealer's total. Numbered cards are worth their face value. Face cards -- Kings, Queens and Jacks -- are each worth 10. Aces are worth either 1 or 11, whichever is better in the circumstances. If the total value of your cards exceeds 21, you "bust", which means you lose. If your total is less than or equal to 21 and the dealer's total is over 21, then the dealer busts and you win. If neither your total or the dealer's total exceeds 21, then the higher total wins. In the event of a tie, no one wins and no one loses. A tie is called a "push". You start the game by placing your bet. Next the dealer deals two cards to you and one to himself. Usually these cards are dealt face-up. Then the dealer gives himself a second card face-down. This is called the hole card. Now you have to make a decision: do you take another card ("hit") or pass to the dealer ("stand" or "stay"). If you hit, the dealer gives you another card and again asks if you want to hit or stand. You keep hitting until you are satisfied with your total or you bust. The dealer must keep taking cards until he has 17 or more. So when should you hit and when should you stand? Check out our blackjack strategies page. Here are a few other basic rules you'll need to know. If the first two cards dealt to you or the dealer are an Ace and a ten-count card (10, Jack, Queen or King), that is "blackjack". If you have blackjack, you win automatically, unless the dealer also has blackjack, in which case it is a push (tie). 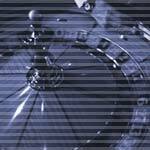 Blackjack pays higher than an ordinary win, which pays even money. Blackjack pays 3 to 2, meaning you win 3 dollars for every 2 you bet. Blackjack is sometimes called "a natural". After you receive your first two cards, you may have the option to "double down". This means you can double your original bet. Most casino only allow you to double down when the value of the first 2 cards is 9, 10 or 11. If you double down, the dealer will give you only one more card and then draw the cards needed to complete his own hand. When your first two cards have the same value (for example, a pair of sevens), you have the option to "split". To split, you have to place another bet equal to your original bet. Then the two cards are split and you play them as separate hands. Some casinos allow you to "resplit" if you get another same-value card. Special rules apply when you choose to split Aces. When you split Aces, you only receive one more card on each hand and if you get 21, it is not considered blackjack. When the dealer's face-up card is an Ace, some casinos will ask if you want "insurance". The cost of insurance is half your original bet. Your insurance bet pays 2 to 1 if the dealer gets blackjack, which will equal the amount you lose on the original bet. For example, say your original bet was $10. The dealer has an Ace showing and you decide to place an insurance bet for $5. If the dealer gets blackjack, you lose your original $10 bet but win $10 on the insurance bet so you are even. If the dealer does not have blackjack you lose your $5 insurance bet and play the hand by normal rules. 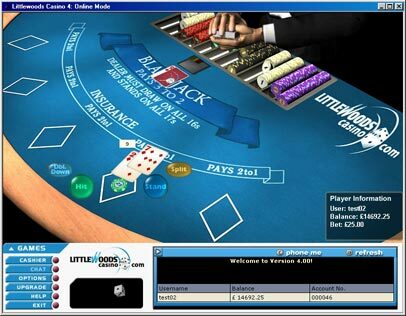 As with other casino games, there may well be other differences between the games offered in each casino, we recommend that you take a few minutes to read the rules section of your chosen casino. You should also try to ensure you play a few 'free' or 'play money' hands first. We recommend William Hill Casino for your next Blackjack Game, they have a full and comprehensive rules section and you can play for fun before you start gambling.